Materials made from metal that are kept outdoors are particularly susceptible to rust. This means that things like garden furniture, fences, railings and other structural components are at especially high risk during the winter and springtime. The damage can become so bad that such items need replacing: is there a way to protect them? Indeed there is: Hammerite Direct to Rust Metal Paint. This unique product is designed to give a robust protective layer to metal surfaces, negating the need for costly replacements. Simple to use and highly-effective, Hammerite Direct to Rust Metal Paint is available to purchase right now from NWTT. 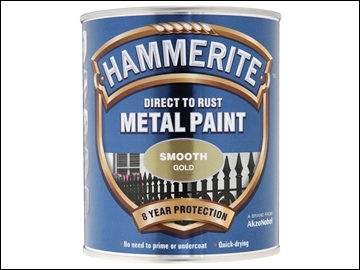 Hammerite Direct to Rust Metal Paint is a highly-specialised 3-in-1 formula and, as the name suggests, can be successfully applied directly to rusted metal without the need for any primer or undercoat. Restoring metal items to their former glory, the product saves you time, money and incon­veni­ence. Dry to the touch within 60 minutes of application, Hammerite Direct to Rust Metal Paint delivers a seamless barrier against water, giving protection that can last for up to eight years depending on conditions. It is ideal for outdoor use, being strongly resistant against the effects of corrosion. Hammerite Direct to Rust Metal Paint is available in a choice of Black, Gold or Red. Both black and gold options are available in can sizes of 750ml; the red option is supplied in a can size of 250ml. While stocks last, the black option is supplied with an extra 33% of formula absolutely free, helping you to make even bigger savings.